By removing the waste and extra fluid from your blood, dialysis does the work your kidneys no longer can do. Once people with chronic kidney disease reach stage 5, or kidney failure, they must undergo dialysis regularly or get a kidney transplant to survive. Many people do dialysis three times a week as an outpatient at a dialysis center – Puget Sound Kidney Centers operates six such centers in counties north of Seattle. But for some people, being tied to a center isn’t ideal. If you’re looking for a little more freedom and flexibility with dialysis, home dialysis might be right for you. In 2010, the Medical Education Institute asked nephrologists in the U.S., ‘If you had kidney failure and had to wait five years for a transplant, which type of dialysis would you choose?’ An overwhelming majority – 91 percent in fact – said they’d do a type of home dialysis rather than dialyzing in a kidney center. More flexibility. Home dialysis gives you more freedom with dialysis, allowing you to create a flexible dialysis schedule, making it easier for you to work and travel. Overall, home dialysis often means less interruption in your daily life. The ability to take control of your kidney health. With home dialysis, you’re really in control of your kidney health. You work with your nephrologist to put together a plan for dialysis, fitting it in around work or other regular activities. You decide if you’d like to dialyze at night, you put your own needles in (or have a care partner help you) if you do hemodialysis at home and you keep your own treatment logs. The option to have more dialysis and thus feel better. It’s simple – most people feel better with more dialysis treatments. Your kidneys used to work 24 hours a day, seven days a week. With dialysis in a center, you would likely receive the standard three treatments a week, each about four hours. That means your kidneys are only working 12 hours a week, or half a day instead of the seven days they were working back when they were healthy. With home dialysis, you have the opportunity to give yourself more dialysis, which leaves most people feeling a lot like they did before they get sick. How does home dialysis work? Hemodialysis uses a filter, called a dialyzer, a dialysis machine and rinsing fluid, called dialysate, to clean your blood of wastes and remove extra fluid. In a dialysis center, the hemodialysis machines is quite large – at home, you’ll have a much smaller machine. Most home dialysis machines weigh about 75 pounds and can fit on a bedside table or nightstand. 1. Dialyze five days a week, for about three hours at a time. 2. Dialyze overnight, while you sleep, three or more days a week. If you and your doctor decide hemodialysis at home is right for you, you’ll undergo training at one of our centers to learn how to give yourself treatments at home. To learn more about hemodialysis at home, contact our home department at 425-259-5195. With peritoneal dialysis, or PD, your own body acts as a filter. First, to prepare for PD treatments, a surgeon will place a tube, called a PD catheter, in your abdominal cavity. Several weeks after the minor surgery, you’ll be able to start PD treatments. During a PD treatment, called an ‘exchange,’ cleansing fluid (dialysate) is placed in your abdominal cavity to draw out waste and extra fluid from the blood. After a period of time, usually two to three hours, the dialysate containing waste and extra fluid is drained and replaced with new, clean dialysate. These ‘exchanges’ can either be done during the day by hand or with a machine overnight. 1. Do three to five exchanges each day by hand. 2. Use a small machine, one that easily fits on your bedside table, to do exchanges for you every night while you sleep. One benefit of PD? It doesn’t involve needles. If you and your doctor decide PD is right for you, you’ll train with our expert staff to learn how to give yourself treatments at home. To learn more about peritoneal dialysis, contact our home department at 425-259-5195. Considered the gold standard for hemodialysis access, a fistula is a device placed in your body, usually your arm, that connects a vein and an artery. This makes regular dialysis treatments possible. A fistula takes several months to mature so if possible, plan ahead and get one placed before you need to start dialysis. If you need to start dialysis sooner, your doctor might suggest a graft or a catheter as your dialysis access. Both these accesses allow for repeat dialysis; however, the chance of infection with both a graft and a catheter is higher. When possible, make a plan with your doctor to get a fistula, the safest hemodialysis access, placed. To learn how to give yourself hemodialysis treatments at home, you’ll undergo training at one of our centers. Training typically takes about four to six weeks. You’ll learn how to put your own needles in, order supplies and keep treatment logs. 1. Get a peritoneal dialysis catheter. To do PD, you need an access. A surgeon will place a peritoneal dialysis catheter, a thin tube, in your abdominal cavity. This surgery is usually done as an outpatient. Your PD access will stick out a bit, near your belly button, but is easily hidden by clothes. After about a week, you’ll be able to start learning how to give yourself PD treatments. To learn how to give yourself PD treatments at home, you’ll undergo training, which lasts about a week, at one of our centers. You’ll learn how to do exchanges by hand or with a machine, order supplies and keep treatment logs. To learn more about home hemodialysis or PD, contact our home department at 425-259-5195. ✓ You’re looking for a flexible schedule. You want the flexibility to dialyze at home or at work. ✓ You’re interested in more dialysis. You like the idea of more dialysis – more than the standard three treatments you’d get in-center – and how that will most likely make you feel more energetic. ✓ You’re OK managing your care at home. You’re confident about taking control of your kidney health (and, if you’re on hemodialysis at home, OK putting in your own needles) or you have a care partner to help you. ✓ Dialysis overnight sounds best. You’re interested in dialyzing overnight while you sleep. ✓ You’d like to travel with your equipment. You like the idea of traveling with everything you need for dialysis — packing your equipment and hitting the open road without needing to book dialysis treatments at your destination. Do I need to have a care partner to do home dialysis or can I do it myself? Although many people feel better having a care partner help them with home dialysis, you can learn how to do it by yourself. If you decide on hemodialysis at home and want to do it without a care partner, you’ll need to learn how to put your own needles in. Although this might take a bit more training, many people do learn how to do dialysis at home, both hemodialysis and peritoneal dialysis, without a care partner. Can I do both in-center dialysis and home dialysis at the same time? Not usually. Due to scheduling difficulties, we usually prefer our patients to chose either home dialysis or in-center dialysis. However, if you’ve been doing home dialysis, but wish to switch to in-center dialysis, you can certainly do so. Speak to your social worker to see how to make that change. What do I do if I have a problem with dialysis at home? Although you’re at home doing dialysis, we at Puget Sound Kidney Centers still support you 24 hours a day, seven days a week. If you have a problem with dialysis, you can always call 425-259-5195 to get assistance. If you have a major health problem and need help right away, call 9-1-1. If I do home dialysis, will I still see my nephrologist as often? 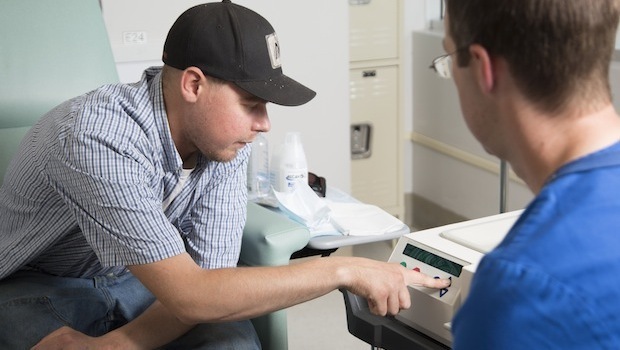 If you do dialysis at home, you’ll still visit Puget Sound Kidney Centers once a month to meet with members of your care team and go over your lab results and treatment logs. Your nephrologist may see you at that monthly meeting or prefer that you meet more frequently. Work with your nephrologist to create a schedule that gives you the support you need and remember, you can call 425-259-5195 24 hours a day, seven days a week if you have any problems with dialysis at home. Can I travel while doing home dialysis? Yes! With a little planning, you can travel anywhere in the United States, and many places around the world, while on home dialysis. You can decide to bring your equipment with you, in which case you’ll need to bring enough supplies to last the duration of your trip, or you can set up dialysis treatments at a dialysis center at your destination. Learn more about traveling on dialysis and start planning your next trip today!